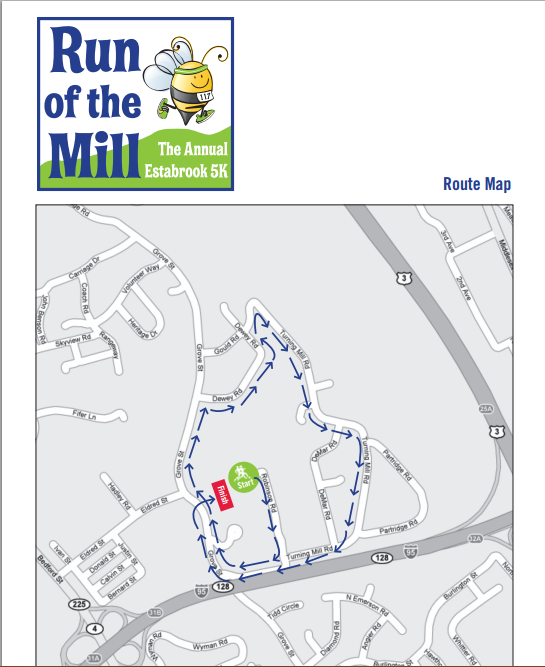 The Estabrook PTO is proud to sponsor its 10th annual Run of the Mill! On Sunday, May 20, all families and friends of Estabrook School are invited to join in this healthy, fun and exciting community event. Starting at Estabrook, the winding, hilly 5K course takes runners and walkers through the beautiful Turning Mill neighborhood, finishing back at the school. After the race, participants and spectators are invited to join in the post-race party. Proceeds from the race will benefit the Estabrook Elementary School. Registration fee is $25 for the 5K if registered by Saturday, May 19. Registration fee is $30 for the 5K on race day, Sunday, May 20. Bib pick-up will be available on Saturday, May 19 at a time and place TBD. (We will notify all registrants once determined.) Pick-up will also be available Sunday, May 20 beginning at 8:30 AM before the start of the race. Every participant must wear their numbered bib because it will contain the timing chip. Every participant's time will be recorded with the aid of the chip that is in the bib. The bib will be included in your registration packet. You must wear the bib to be timed and scored. T-Shirts will be available for the first 200 entrants. Please specify size on the registration form. Kids 10 and under running the 5K course must be accompanied by an adult. The parent or guardian of that runner must sign a waiver. There are significant elements of risk in any sport or activity associated with running and walking, including this Estabrook PTO Run of the Mill ("the Activity") and related activities that are incident thereto. I acknowledge that the following describes some, but not all, of the risks of participating in this Activity: inclement weather, lightning, extremes of wind, weather and temperature; heat and sun-related injuries or illnesses including sunburn, sunstroke and dehydration; fatigue, chill and dizziness, which may diminish reaction time and increase the risk of an accident, falls, contact with other participants, traffic and road conditions. I am aware that the Activity entails risk of injury or death. I understand the description of these risks is not complete and that unknown or unanticipated risks may result in injury, illness or death as a result of participation in the Activity. I hereby knowingly and freely assume all such risks, both known and unknown, including full responsibility for and risk of bodily injury, death or property damage as a result of my participation in the Activity, even if the injury, death or property damage is caused, in whole or in part, by the negligence of the Estabrook PTO/Run of the Mill, and any or all of its owners, officers, directors, agents, subsidiaries, committees, volunteers, boards and employees ("the Releasees"). I verify that I am sufficiently fit, trained, qualified, and capable to participate in the Activity. I assume full responsibility, for myself and any minor children for whom I am responsible, for any bodily injury, accident, illness, death, loss of personal property and expenses related thereto as a result of any accident which may occur while I participate in the Activity. I assume the risks of personal injury, accidents and/or illness including but not limited to sprains, torn muscles and/or ligaments, fractured or broken bones, eye damage, cuts, wounds, scrapes, abrasions, contusions, dehydration, oxygen shortage, heart attack, exposure, head, neck and spinal injuries, insect or animal bites, allergic reaction, shock, paralysis or death. I, the participant or parent/guardian of the participant, for myself, my heirs, representatives, assigns, and next of kin, in consideration for registration and participation in the Activity, do fully and forever release, waive, discharge, hold harmless, and covenant not to sue the Releasees from all liability to the participant, his/her personal representatives, assigns, heirs, and next of kin for death, personal injury, or property damages and from any and all claims, demands, suits, loss and causes of action on account of death, personal injury, or property damages suffered or sustained by me or any person or property as a result of or arising out of my participation in the Activity, whether arising from the negligence of the Releasees or otherwise, to the fullest extent permitted by law. By accepting, I acknowledge that I have read this release of liability and assumption of risk agreement, fully understand its terms, understand that I have given up substantial rights by signing it and sign it freely and voluntarily without any inducement. All fees are non-refundable. No minor under the age of 10 shall be left unattended during this event.